Crestron announced that their V-Panel 20” HD Touch Screen Display (TSD-2020) is now shipping. 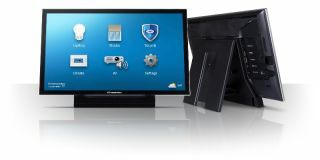 The thin TSD-2020 integrates into residential or commercial environments, replacing separate touch screens, TV displays, and computer monitors with one device. It can be a home controller and television display for a luxury kitchen or bedroom, as a presentation control panel for a university lecture hall, or as a video control surface for corporate and government command centers. In addition to lectern, articulating arm, and VESA mounting options, Crestron announced that a flush-mount wall bracket for the TSD-2020 will be available soon. The TSD-2020 merges Crestron capacitive touch technology with HD video to create a versatile touch screen display. Its 1920x1080 screen offers multi-window display of HDMI and other video sources, as well as an ultra-wide 178 degree viewing angle. With three times the contrast ratio of earlier Crestron V-Panel displays, the TSD-2020 delivers shadow definition and deep color saturation.